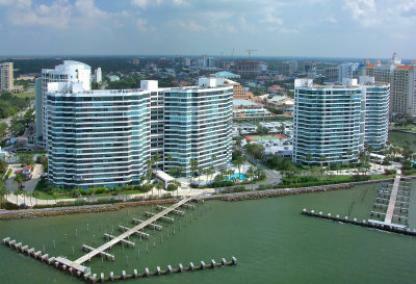 Beautiful views of Sarasota Bay, the John and Mable Ringling Bridge, and affordability are highlights of the "Condo on the Bay" development. 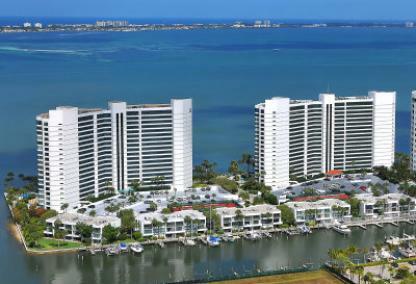 Built in 1982, the two high-rise buildings here feature two and three bedroom residences with unrivaled views. There is also a separate section of larger townhouses on the protected harbor behind the private entrance gates of this highly desirable community. A few of the townhomes stretch to over 5,000 square feet. Residents enjoy living in the heart of the downtown cultural district. Shopping, restaurants and professional services are all located nearby. Siesta Key Beach and Lido Key Beach are just minutes away for sunning, fishing, swimming and shelling.